Now that you’ve done some thinking about gardening, decided on what you really like to eat and are itching to start, let’s look at the two biggest foundations of your future awesome garden- seeds and soil. Entire books have been written about both of these topics, indeed, multiple professorial degrees have been awarded in each. Let’s start simply, shall we? 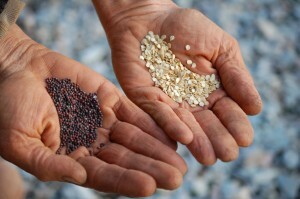 You need the best possible seeds to grow the best possible garden to have the best possible food on your dinner table. Make sense? Even more so for soil. Great soil will grow good food from mediocre seed, but the reverse is not true. At all. The best seed won’t do anything in poor soil. It may not even germinate, or send up a sprout. You’ll need to spend some time getting your garden plot ready to plant. This means starting with as clean of a slate as possible- removing grass, weeds and rocks, then tilling or digging the soil to loosen it up and prepare it for adding compost. As with most projects, time spent here really pays it forward down the road. Spend the time now to get it as right as possible to save you extra time later on. Great soil is a living community that needs to be fed, sheltered and given some attention. Sort of like a pet, but won’t mess your floors. The best way to feed your soil is with compost. We’ve written a great article on compost here- Compost- Nourishing Your Garden Soil. It doesn’t need to be difficult, but too many people make it that way. Here are several more articles on Soil Building that we’ve written that will help further your education. This is where starting small really makes sense, as feeding the container soil is as easy as getting a bag of Organic compost and mixing it with the soil in the container, and you’re done. A small garden plot is a little more involved, but not much more. Add the bag of Organic compost to the top of the row where you’ll plant, and dig it in with a small shovel or garden fork. What you’re looking for is a soil that is loose, but has structure- meaning not compacted into clods, or like a handful of sand. You should be able to see the organic material from the compost, along with the native dirt you started with. If you’re lucky, there will be some living organisms as well- pillbugs, multiple legged insects of several sizes and, if you are lucky, earthworms. They aren’t really a result of luck, but of good soil building efforts. Earthworms are respected and anticipated when you start working the garden soil, as they indicate that things are going well and the soil community is happy. When there are earthworms, you can almost always be assured of a good garden season, as the soil is healthy and full of nutrients and minerals the plants need for the best production. Now that the soil is ready, you need some seeds! Here is where we need to discuss a few terms, so everyone is on the same page. Heirloom seeds are becoming increasingly popular today, but many folks don’t really know what the term means, but are afraid to ask. Well, here they are! These are basic, introductory terms. For an article discussing the benefits of heirlooms and the origins of hybrid and GMO seeds, read What Are Heirloom Seeds? Heirloom– simply means something that is valued and old, typically passed down from generation to generation. Think of your great-grandma’s heirloom china, silver or furniture. Same thing with seeds, they were valuable enough to be saved and passed down from one generation to another. Open pollinated– This is what most people mean when they say heirloom. 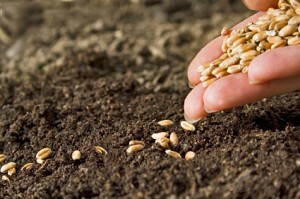 Open pollinated seeds can be saved and re-planted from year to year and will grow true to their parents. No one “owns” patents or rights to the seed, so they can be freely sold, traded and passed along. Hybrid– This is what is found in most garden centers and large mail-order seed companies. This is a deliberate cross of two parents of the same species for certain characteristics in the plants. For example- two tomatoes or two peppers are crossed, the resulting seed is a hybrid. This seed cannot be saved and re-planted to get the same type as the parent. It won’t grow true, so you are forced to buy fresh seeds each year. No passing along seeds here. Genetically Modified Engineering– This is a controversial technology, as it uses genes from completely different species to “turn on” or “turn off” specific genes in the plant. For example, using a gene from a virus to turn on herbicide production in the plant itself. The concern with using this type of technology is what happens when these technologies migrate to other plants or animals, and what are the effects? For the purpose of planting your personal garden, we recommend open pollinated, heirloom seeds as a first choice, with hybrids as a second. GMO seeds aren’t typically available to the home gardener, but there are some in corporate test plots, and possibly on the horizon. Things to look for when shopping for seeds is a quality seed, grown and marketed by a knowledgeable company that is committed to the customer’s success. This is a situation where price should not be the primary concern, and the old adage of, “You get what you pay for” is certainly true. Does it matter that you saved a dollar a packet, only to have few or no seeds come up? Or to have them be the wrong variety? Don’t be caught in false economy. So, how do one know when they are dealing with one of the above mentioned companies? There will be a lot of information presented, to help educate you on what’s important. There will be discussions on quality, what is being done to maintain and improve standards, quality control measures and a general openness to the information delivered, without a constant focus on the sales pitch. You should feel comfortable doing business with the company, be able to ask questions and get a real live person on the phone in a reasonable amount of time. Emails should be answered. Your success as a gardener, regardless of your experience, will be a primary concern. Usually, these types of companies are smaller and family owned and run. Their business models are heirlooms, just like the seeds they sell.